Innovative. Iconic. ck cogent. Designed for the confident man or woman. 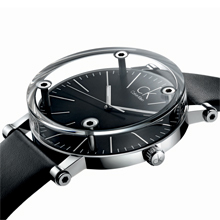 This modern and architectural timepiece features four visible screws that hold up the crystal, similar to the pillars of a bulding. 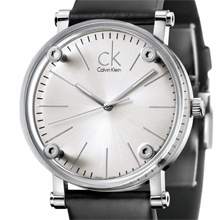 The watch is offered with a polished stainless steel case with either a black or silver dial, and is finished with a black leather strap with a deployment buckle. 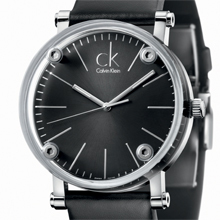 ck cogent is crowned with luminous hour and minute hands and a discrete ck Clavin Klein logo at 12 o'clock.